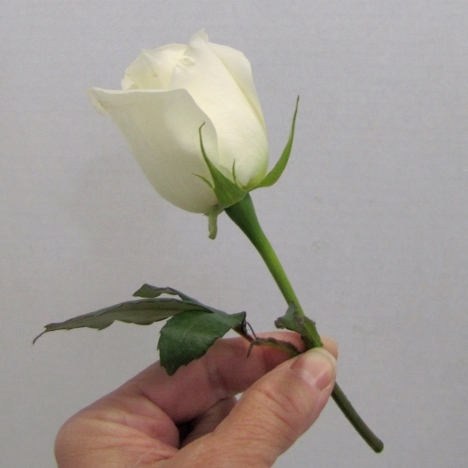 Standard bulk roses are shipping with their protective petals still attached. These petals may look bruised or torn, but their purpose is to protect the inner rose until designing with the flower. Remove these petals right before designing. 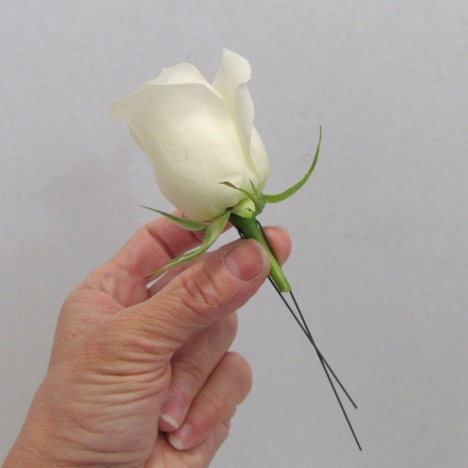 Cut the stem short under the flower head. I leave the actual stem only if I intend for it to be a part of the final design. 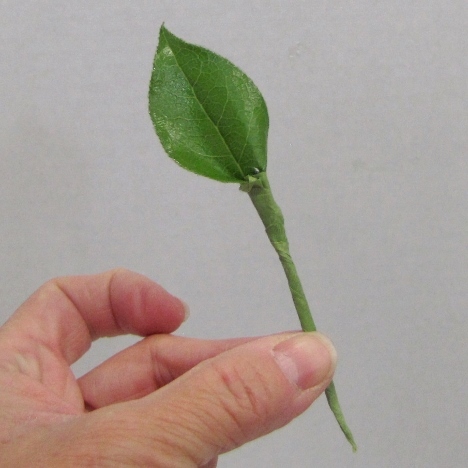 Stems tend to get bulky and awkward looking after taping on several leaves and filler flowers. Cut off the biggest proportion of the stem. Leave about an inch of the natural stem on below the flower head. 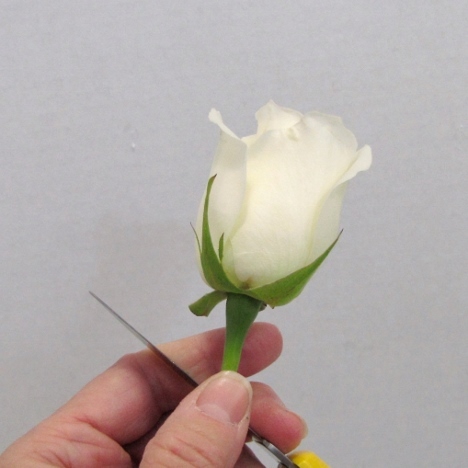 Insert a 26 gauge wire sideways into the thick bulb part of the rose, right below the flower head. 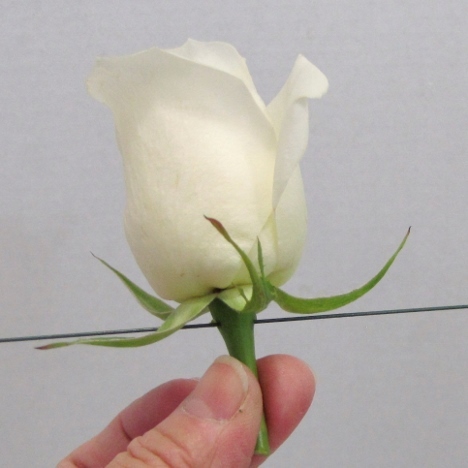 Fold the wires down parallel to the rose stem to create a thinner, more flexible stem. 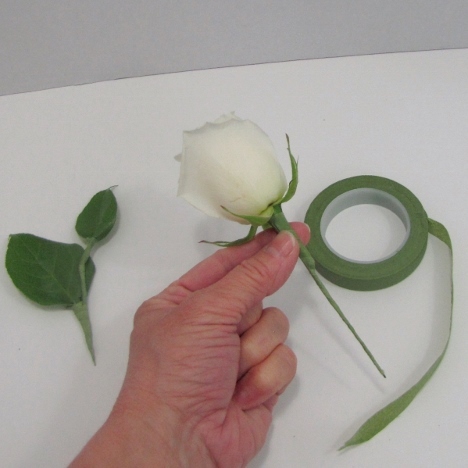 Use green floral tape to create the stem. Wind the tape around the stem, pulling tightly in a downward motion so that the tape stretches and adheres to itself. 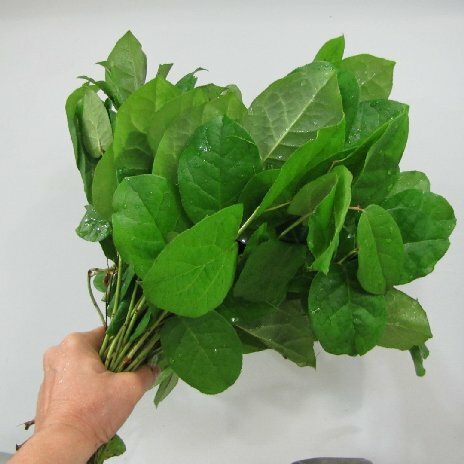 Salal (also commonly referred to as lemon leaf) has glossy green leaves that are firm and hold up very well for corsage and boutonniere work. 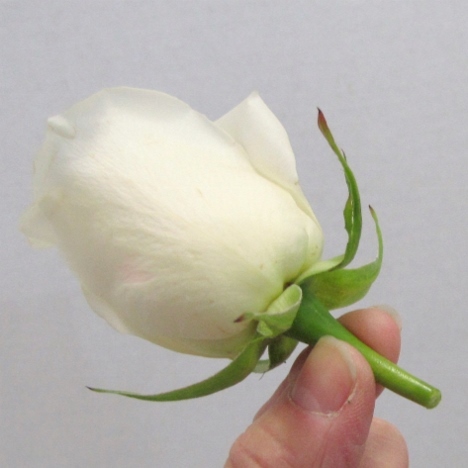 They are beautiful for greening in bridal bouquets, centerpieces and church florals. 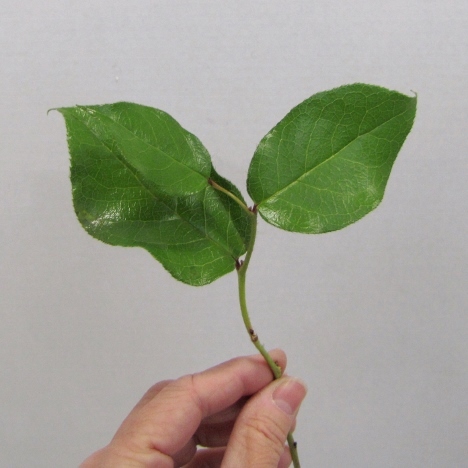 The leaves are prettily shaped and sturdy enough to be wired. 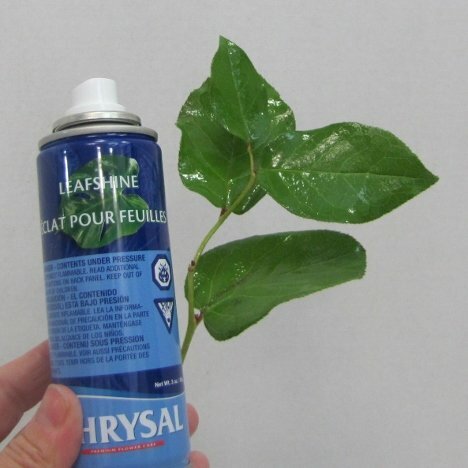 I spray all my greenery with a leaf sealant called Leafshine. It seals the greens, keeping moisture in and letting the greenery last longer. Greenery is sometimes splotchy with a white residue because of hard water spotting. Leafshine will remove that. 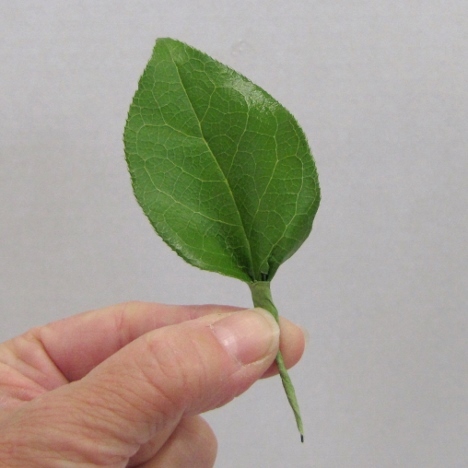 Cut the individual leaves off their main plant stem. 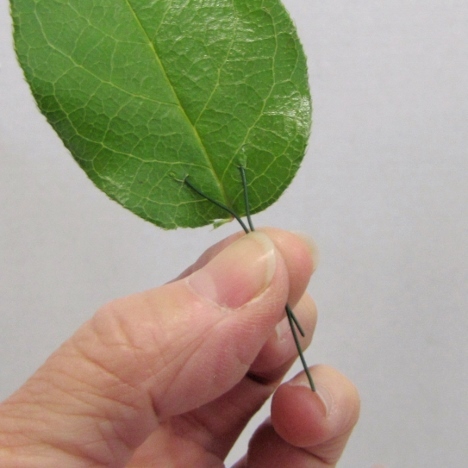 Pierce the leaf the with florist wire (I use 26 gauge). 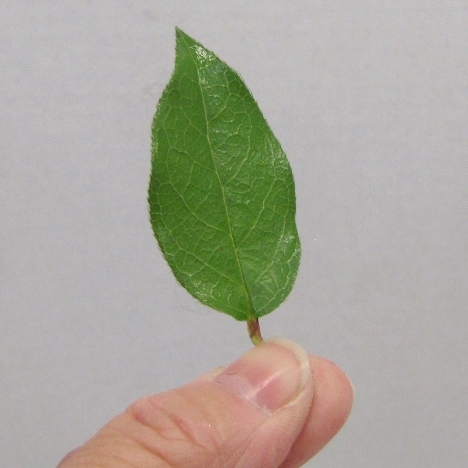 Place your thumb and forefinger and pinch tight where you pierced the leaf. Then fold down the two wires parallel to the stem. Tape with green corsage tape. 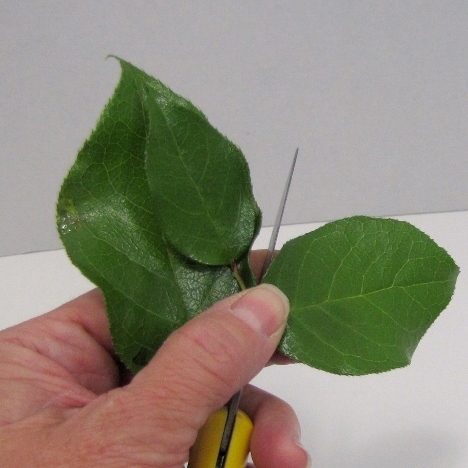 Do this with various sized leaves to give some variety and character to your boutonnieres. Wire all leaves in a similar manner as above. 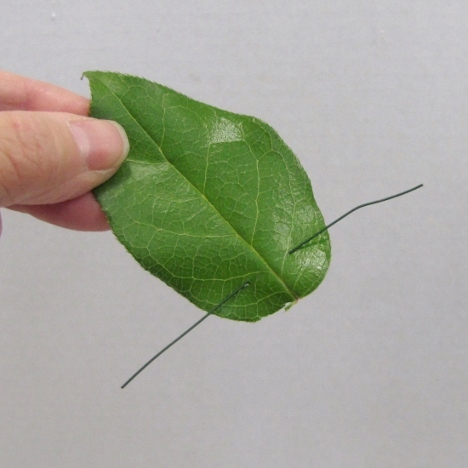 Be careful not to tear the leaf as you bend the wires down. 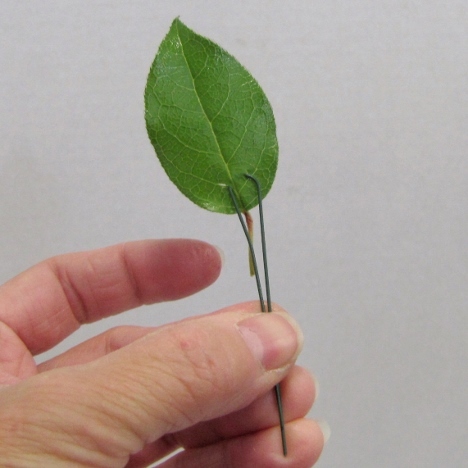 Wiring will allow you to bend the leafs forward and backward, giving you great control over placement in your boutonniere design.